Cutaneous manifestations associated with vitamin B12 deficiency are skin hyperpigmentation, vitiligo, angular stomatitis, and hair changes. A diagnosis of vitamin B12 deficiency is often overlooked in its early stages because these signs are not specific to vitamin B12 deficiency alone. There is a paucity of reported cases of vitamin B12 deficiency where mucocutaneous lesions predate other manifestations. A 34-year-old woman complained of skin lesions that had developed on both her feet over the past 1.5 months. She was a nonvegetarian. She was under the care of an endocrinologist for hyperthyroidism and was using a 7.5-mg dose of carbimazole daily. 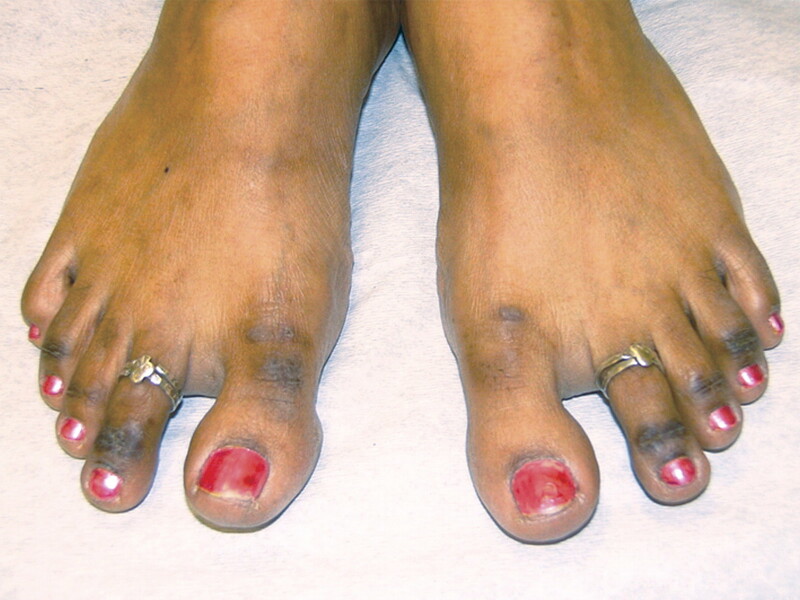 On examination, she had nonitchy, hyperpigmented macular lesions predominantly on the dorsum of the middle phalanges of the toes of both feet (Figure 1). There was no rash or dermatitis preceding the onset of hyperpigmentation. This was her only physical sign. Clinical examination was otherwise unremarkable. There were no clinical features suggestive of autoimmune disorders. The vitamin B12 level was 113 pmol/L (normal range 132 to 857 pmol/L). The full blood count and mean corpuscular volume were within normal limits (normal range 80 to 97 fL). As there was no other cause for the hyperpigmentation except for a low serum vitamin B12 level, she was started on intramuscular injections of 1000 μg of vitamin B12 followed by a vitamin B complex (vitamins B1, B6, and B12) tablet daily. The vitamin B12 level after treatment was 300 pmol/L. The hyperpigmented lesions improved within 2 weeks of starting treatment. 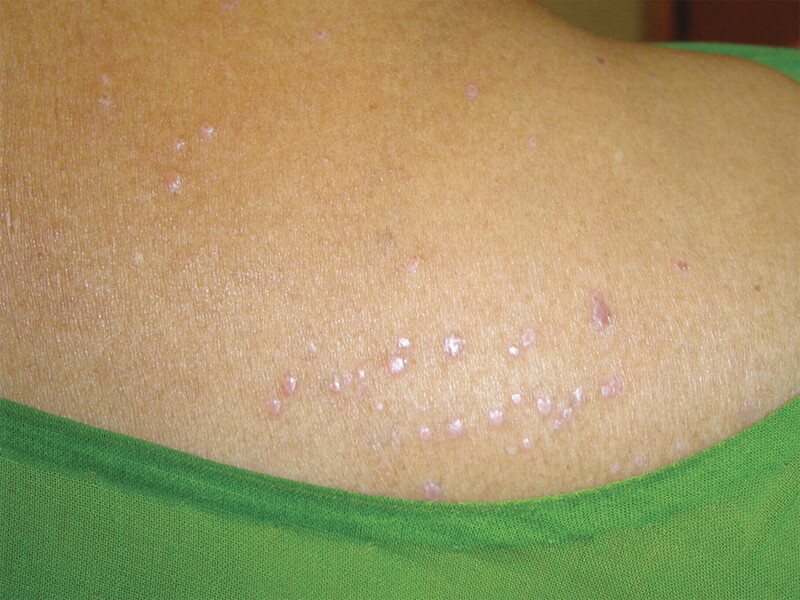 A 54-year-old woman presented with skin lesions that she’d had on her neck and upper and lower limbs for 4 months (Figure 2). Dietary history revealed that she was a lacto-vegetarian. She gave a history of seeing numerous doctors, whose creams and treatments for suspected dermatitis did not improve her skin lesions. She even made a video of her lesions and put it on the Internet, hoping that any doctor worldwide could help her. On examination, the skin lesions were polymorphic and nonpigmented; they were multiple, macular, maculopapular, and vesicular, involving the nape of neck, both elbows, both wrists, and both heels. Examination of the tongue, oral cavity, and central nervous system showed no abnormality. The mean corpuscular volume was 103 fL and the vitamin B12 level was 100 pmol/L. Endoscopy of the stomach showed evidence of pangastritis. The patient had positive test results for parietal cell antibodies. Treatment with intramuscular injections of 1000 μg of vitamin B12 followed by a vitamin B complex (vitamins B1, B6, and B12) tablet daily led to the complete disappearance of skin lesions within 1 month. The vitamin B12 level after treatment was 189 pmol/L. The Case 1 patient had hyperpigmentation over the dorsum of all the toes, similar to the type of pigmentation described by Baker et al.2 There was no hyperpigmentation over palm creases and flexures. The hyperpigmentation related to vitamin B12 deficiency is more common in darker-skinned patients. In Case 2, the patient had skin lesions that were not pigmented. This was an unusual presentation, differing from the earlier reported cases.2–4 She had positive test results for parietal cell antibodies. The elevated macrocytic index and the dietary history were the diagnostic clues in this patient. Oral ulcers11 and vitiligo were not present in either of our cases. The common cause of vitamin B12 deficiency is malabsorption.12 It takes 2 to 5 years to develop vitamin B12 deficiency, even in the presence of severe malabsorption.13 Our patients did not have clinical features suggestive of malabsorption. A skin biopsy, measurement of metabolites (such as serum methyl malonic acid and homocysteine), and a Schilling test would have thrown more light on the diagnosis. The patients were not keen in getting the above tests done. Furthermore, most of the tests require referral to a tertiary hospital and cannot be done in the ambulatory setting. Vitamin B12 is present only in animal foods, cannot be synthesized in the human body, and must be supplied in the diet. Therefore, a detailed history of food and dietary habits is needed when evaluating skin lesions. The treatment of vitamin B12 deficiency in pernicious anemia is 1000 μg of vitamin B12 by intramuscular injection every day or every other day for 1 to 2 weeks, followed by monthly injections for 3 months, and thereafter every 3 months for life.1 Those who are deficient for nutritional reasons can be maintained on oral cobalamin tablets after their course of vitamin B12 injections. A patient presenting with cutaneous lesions alone should make us highly suspicious of the possibility of vitamin B12 deficiency. We should be more aware that cutaneous lesions not responding to conventional therapy could very likely be an indication of vitamin B12 deficiency. These skin manifestations respond quickly to vitamin B12 therapy. Early treatment with vitamin B12 will prevent the serious complications of vitamin B12 deficiency. Skin lesions associated with vitamin B12 deficiency are skin hyperpigmentation, vitiligo, angular stomatitis, and hair changes. Cutaneous lesions that do not respond to conventional therapy can be an indication of vitamin B12 deficiency. Malabsorption is the most common cause of vitamin B12 deficiency. Initial replacement is usually through intramuscular injections. Those with normal absorption can be maintained on oral replacement. La déficience en vitamine B12 peut s’accompagner des lésions cutanées suivantes: hyperpigmentation, vitiligo, perlèche et modifications des cheveux. Les lésions cutanées qui ne répondent pas aux traitements habituels peuvent signaler une déficience en vitamine B12. La malabsorption est la cause la plus fréquente d’une déficience en vitamine B12. On utilise généralement la voie intramusculaire pour le traitement de substitution initial. Si l’absorption est normale, le traitement peut se poursuivre par voie orale.